Title slide for my August 19th interview presentation. 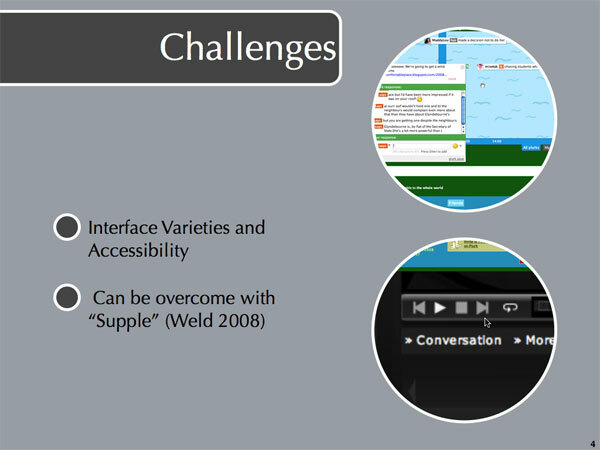 I was given the remit of presenting a five- to ten-minute presentation on the “Challenges Affecting Disabled in E-Learning”. 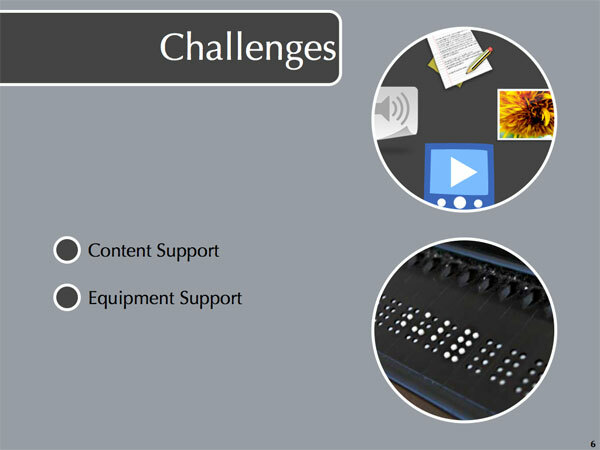 The interview was for an associate lecturer position on the new H810: Accessible online learning: supporting disabled students postgraduate course, part of the M.A. in online distance education. 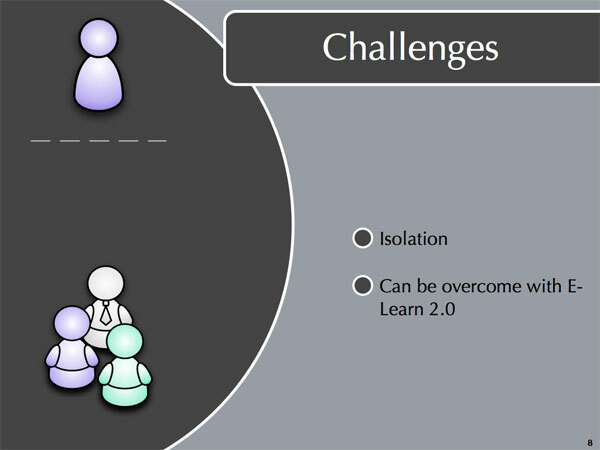 I ran across this paper from Educause Quarterly by John Campbell and Diana Oblinger about the top ten challenges for teaching and learning for 2007. I guess they had to wait until 2007 was almost over before knowing what those challenges were because this didn’t appear until November. I was particularly struck by issue number four: “Selecting Models and Strategies for E-Learning”. One of the key questions posed there was “What are the learners’ characteristics (educational preparation, desired outcomes, preferred delivery modality, technology, skills, services, and support needed?” This was intended for general e-learning, but I think it’s even more important to e-learning for the disabled. higher education, especially with e-learning. 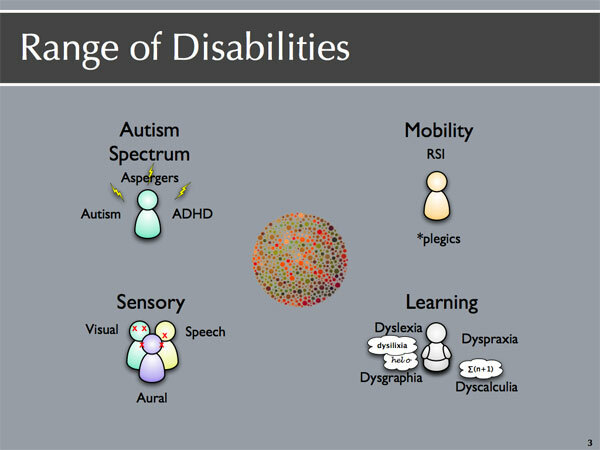 the various kinds of mobility impairments: quadriplegics or paraplegics. 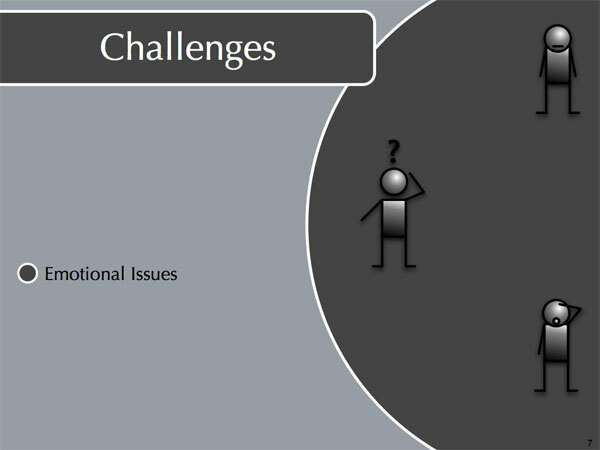 of people and presents issues for e-learning. difficult to use by non-disabled on portable devices, like the iPhone. to people on different devices and those using assistive software. 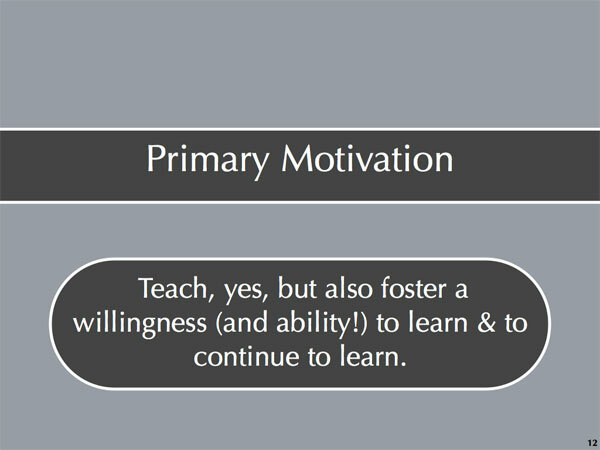 we don’t always have control over the design of materials used in e-learning. application areas for this was web pages and I know that Niall Sclater at the Open University is already interested in it for exactly that. presentations. 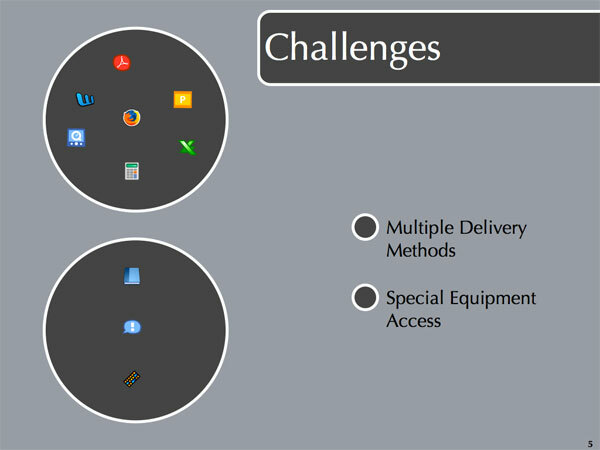 Each of which presents its own accessibility issues. issue of financial accessibility as well. technical issues or know where to point students for help. self-image problems. The last three are particularly common. feeling “different” and left out. 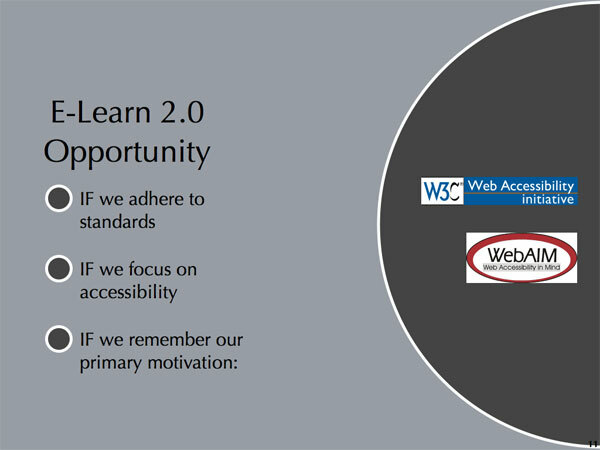 with Learning 2.0, a topic I’ll return to later on in the presentation. modify it or comment on it. 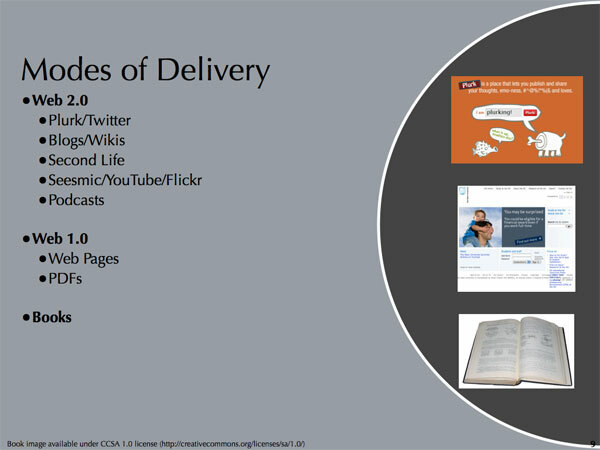 completely by Web 2.0 applications in the near future. truth of the matter is we still have books and other printed materials. addresses for having special arrangements of their materials made available. providing advice on where to go, what to expect, and what questions to ask. “Minds on Fire: Open Education, the Long Tail and Learning 2.0“. 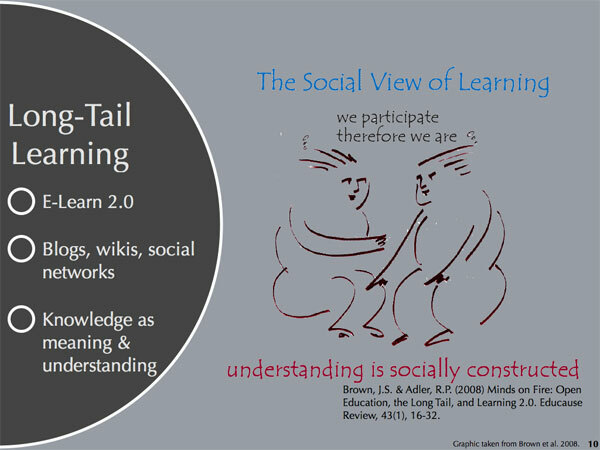 but the “long tail” comes from people’s interactions with learning and knowledge. commodity to be boxed up and distributed. social networks offer a powerful opportunity for the disabled. opportunity will only be there if we remember certain things. Michelle A. Hoyle — August 19th, 2008. The link to download the PDF version was broken. I’ve fixed that. Sorry about that!